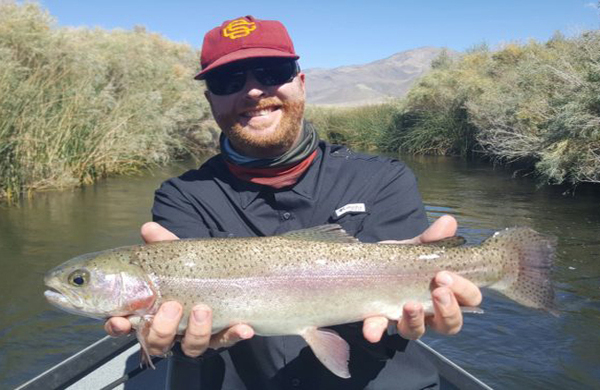 Eric Berkes used the “dip & strip” method of fishing streamers with Doug Dolan and had an amazing day getting into several of these quality rainbows. The bigs are on the prowl thanks to some brood fish being planted. Drift boat trips are consistently landing some trophy rainbows using the “dip & strip” method of streamer fishing. Flows continue to trend up once again, & are running at 240cfs. Great for drifting; however wading/crossing the wild trout section will become more difficult at this release. Caddis activity will remain solid through late October, with Trico mayflies showing when it begins to cool down in the Owens Valley. I would not hesitate to book a drift trip this fall as I believe the “catching” will be very good early on. Chub & sucker fry will be the primary target for the bigs, so have a selection of streamers like Loebergs, Spruce-A-Bu’s, and Punk Perch with a moderate sinking tip line. Good nymphs to have are Assassins, flash back pheasant tails, Drifters Crawlers, olive crystal caddis, olive dubbed caddis, and broken back tiger/zebra midges. This fishery remains open year around. Special regs from the footbridge at Pleasant Valley campground to the fishing monument 4.7 miles downstream.